Physical Description: 57 p., col. ill., 23 cm. Piggie can't wait to go out and play in the sunshine. But will a rainy day ruin all the fun? Bulletin for the Center... - 12/01/2008 Good buddies Elephant and Piggie return and discover that rain can sabotage the best-laid play plans. Piggie has serious outdoor ambitions (“We are going to do everything today!”) until rain begins to sprinkle, then pour: “I am not a happy pig,” she grouses, as the rain flattens her ears and foils her outdoor agenda. 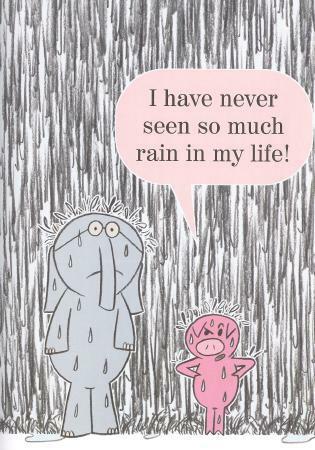 Optimistic Gerald (the elephant) points out two worms that are managing to enjoy themselves in the rain, so Piggie takes inspiration and decides to go ahead and try her activities despite the deluge. The friends have fun running, skipping, and jumping in the rain, until it ends, and Piggie is once again unhappy—until Gerald sprays water out of his trunk to make “rain” for her. Although perhaps more pages than necessary are devoted to Piggie’s exclamations of dismay, kids will easily relate to the frustration caused by uncooperative weather. Willems’ illustrations of lively Piggie and rotund Gerald are still animated and amusing; the limited color palette, bold drawing strokes, and emphasis on facial expression and body language help to give focus and flesh to the spare, beginning-reader text. Novice readers (and their instructors) will appreciate the helpful use of repetition (“We are going to run! We are going to skip! We are going to jump!”), and loyal Elephant and Piggie fans will be eager to get their trunks and trotters on this next installment. JH - Copyright 2008 The Board of Trustees of the University of Illinois. School Library Journal - 12/01/2008 PreS-Gr 2-In a refreshing reversal of their usual roles, the often-despondent Gerald proves to be a valuable friend to exuberant Piggie when her own naturally sunny disposition fails her. Fretful about the sudden rain that threatens to ruin an afternoon of running, skipping, and jumping, Piggie declares emphatically that she is "not a happy pig." Poor Gerald patiently weathers the rain and her brief tantrum and, as readers might expect, the pair soon make the most of the situation. Alive with movement and feeling, the illustrations tell the story, setting the tone and adding depth to the simple text. The words themselves are manageable for young readers, and these endearing and distinctly developed characters have great child appeal. With a cameo appearance by the Pigeon on the final endpaper, this is a winning addition to the author's canon.-Neala Arnold, St. Francis Elementary School, MN Copyright 2008 Reed Business Information. - Copyright 2008 Publishers Weekly, Library Journal and/or School Library Journal used with permission. Booklist - 11/15/2008 Gerald the elephant and his friend Piggie are outdoors and ready to play when a drop of rain falls “PLINK!” on Piggie’s head. Watching her high-spirited mood dive precipitously through annoyance toward despair, Gerald extends an ear to shelter her. Soon, though, two ecstatic worms cavorting in the rain inspire them to find happiness in wet-weather play. 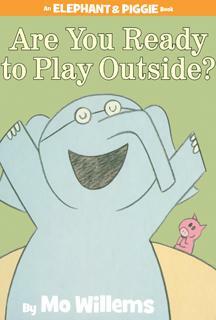 The characters quickly shifting moods provide plenty of laughs, as well as food for thought, in this amiable entry in the Elephant and Piggie beginning-reader series. Willems again combines simplicity and wit to create a child-pleasing text that works beautifully with the cartoon-style illustrations. - Copyright 2008 Booklist.